Walk with the weavers! The Zapotec community of Teotitlán del Valle (elevation: 1,670 meters or 5,500 feet) is world-famous for production of colorful wool rugs (laadi in the local Zapotec language). To address the problem of declining sales and tourism to individual weaver homes, Planeta.com is collaborating with artisans and the local community museum to connect weavers and visitors. Weavers would like more opportunities for direct sales to individual travelers and options for selling online. Some group tours charge high commissions (up to 40%) and taxi drivers hired from Oaxaca City sometimes return to the village, insisting on a commission. "It's not fair," said one weaver. "These people are asking to be paid twice, once by the travelers, then by us." Responsible travelers should pay attention and when possible, arrange an extended tour that visits more than one family and that includes cultural immersion with visits to the community museum, market and church. One of the advantages of a weaver-led tour is that the process of rug creation is shown to the visitor. Visitors have the opportunity to try their hands at carding, spinning, and weaving. Weavers also describe and demonstrate the process of using natural dyes. Among the natural materials used are pericon, cuatle and nuez criolla. Cochinilla and indigo dyes are more expensive. Visits also showcase family involvement. The process of making a weaving involves several generations. Some of the weavers like to experiment with other sorts of wool. Some it it may be imported. If that matters to you as a buyer, ask where the wool comes from. For those buying a treasured rug or other weaving, the sales benefit travelers with lower prices and weavers with higher income. Think smart, travel slow! Joining the first walk in April 2006 were ten people, ranging in age from 6-60. Visitors were led to workshops by weavers and everyone agreed it was a great way to spend the day. A few rugs were purchased and an agreement was made to continue the tours. However, the social crisis of 2006-2007 led to a drastic decline in tourism visits and the formal ititiative was postponed. The second round of tours were conducted on January 23 and 30, 2008 part of the Rural Tourism Fair. There were fewer participants (six the first week, tk the second) but more rugs were purchased. Beyond the tour, Planeta.com is working to create a town guide and directory of weavers. Working with weavers, we are locating their workshops via Google Earth. 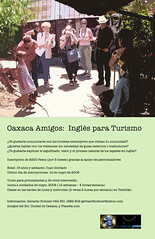 Planeta.com is also a financial supporter and enthusiastic fan of Oaxaca Amigos: English Classes for Community Guides and Rural Artisans. 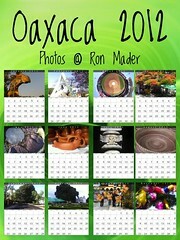 Planeta.com is a financial supporter and enthusiastic fan of Oaxaca Amigos: English Classes for Community Guides and Rural Artisans.